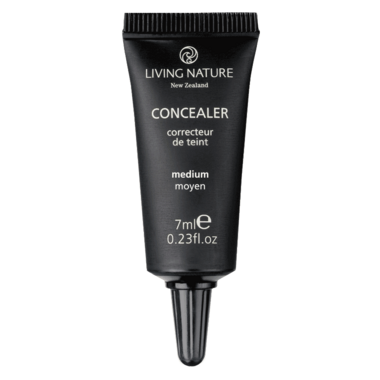 Living Nature Concealer minimizes the appearance of skin imperfections and dark circles around the eyes by helping even out skin tone. Certified natural and made in New Zealand, this concealer has a creamy formula which perfectly matches the Living Nature foundations. For all skin types. This product is certified 100% natural, and not tested on animals. It contains only ingredients created by nature and is both synthetic free and animal free. Ingredients: Aqua (water), Titanium dioxide (CI 77891), Jojoba esters, Mica (CI 77019), Zinc oxide (CI 77947), Macadamia ternifolia seed oil, Simmondsia chinensis (jojoba) seed oil**, Persea gratissima oil (avocado oil), Cetearyl wheatstraw glycosides (&) cetearyl alcohol (wheat straw extract), Glycerin (vegetable glycerin)**, Butyrospermum parkii butter (shea butter)**, Iron oxides (Cl 77492), Mel (manuka honey), Iron oxides (Cl 77491, CI 77499), Talc (CI 77718), Citrus grandis seed extract (grapefruit seed extract), Sclerotium gum, Stearic acid, Cetyl alcohol, Pelargonium graveolens oil (geranium oil)*, Tocopherol (vitamin E), Leptospermum scoparium oil (manuka oil), Melaleuca alternifolia oil (tea tree oil). *From natural essential oils: Geraniol, Citronellol, Linalool. **Certified organic.